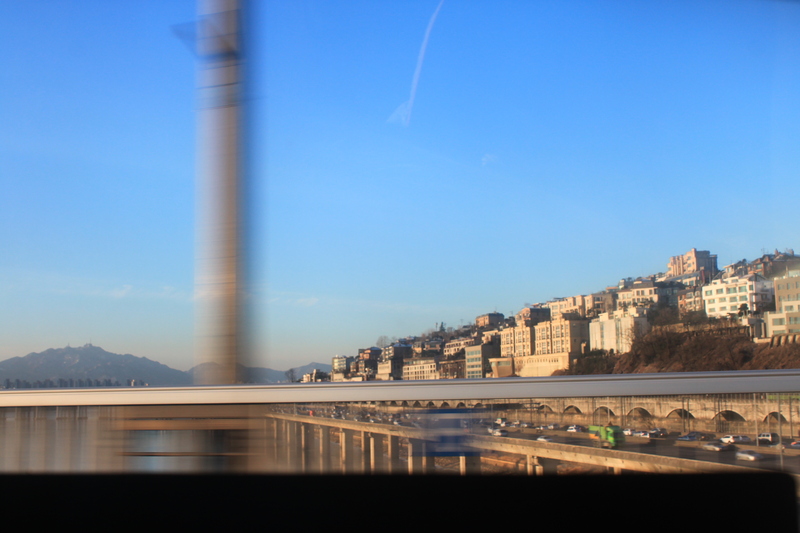 I have always felt there is something sublime about crossing the Hangang River on winter day when the sky is blue. I can remember something of that sensation even from my year in Seoul in 1995. I am not sure if I read it right, but this new financial product seems to be offering you the lottery and a pension at the same time. True innovation. 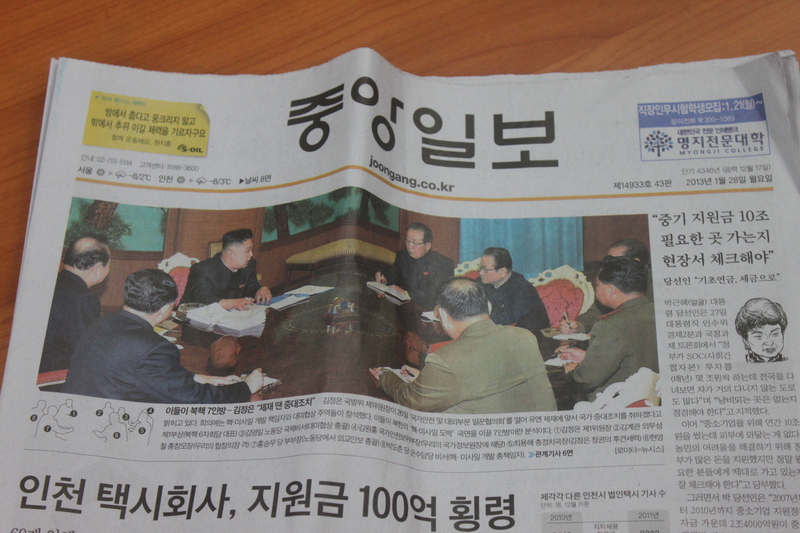 Photo from January 29, 2013 Joongang Ilbo Newspaper shows leader of North Korea Kim Jung Eun gathered at a table talking to his top advisers. The photo is remarkable in that it is not the flat propaganda photograpy we are used to from North Korea but a rather “Western” looking glimpse of a power meeting. The feel on takes away from it is not that different than most photos of leaders in the rest of the world. The ideological wall seems to have finally fallen on both sides. 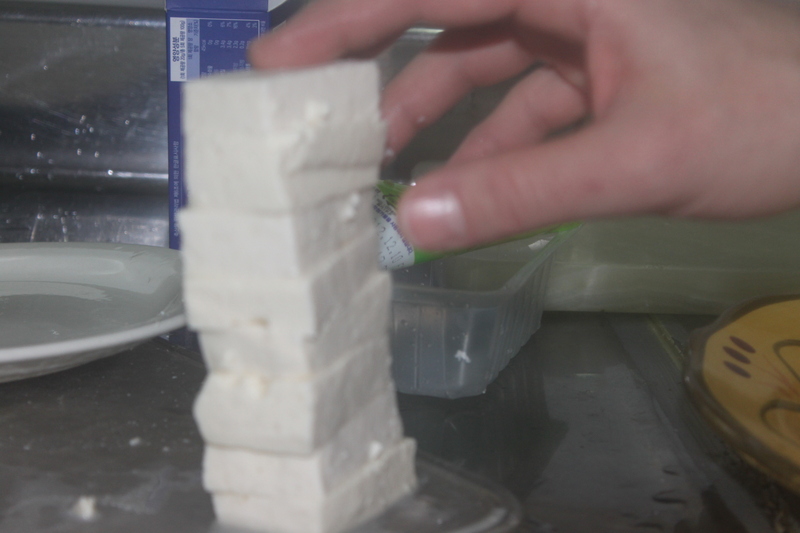 My daughter and I made this tower out of dufu recently when cooking a dinner together. We could not get it to stand up on its own. Let us call it avant garde food art. Jangchung Elementary School is just next door to our home and my daughter Rachel is now in the third grade there. 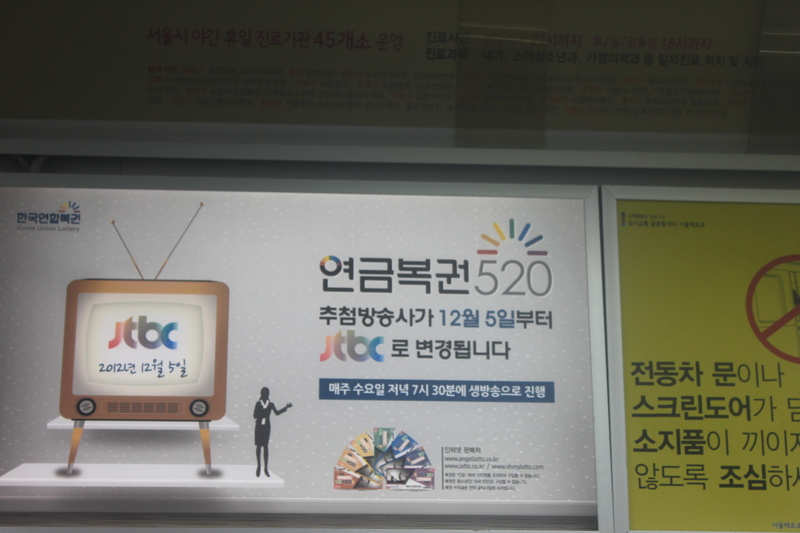 It so happens that president elect Park Geun Hye graduated from Jangchung Elementary some years ago. 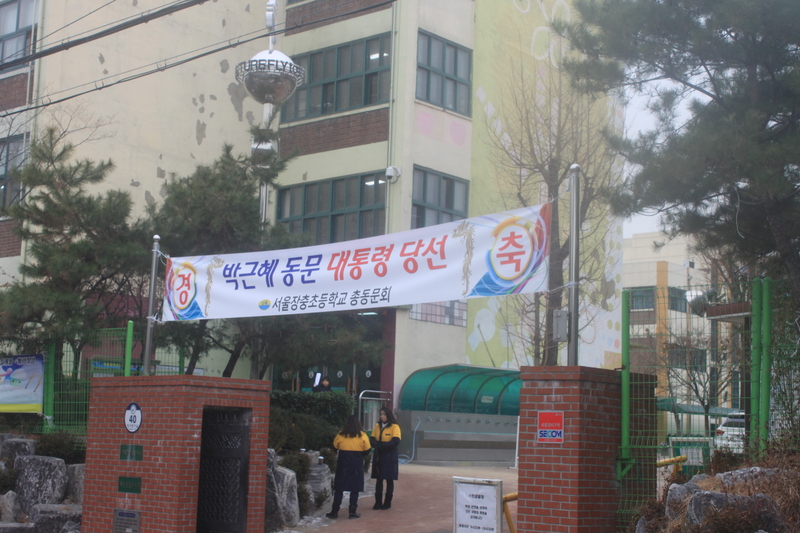 The school put up this congratulatory banner. Rachel had a chance to see Ms. Park up close when she made a surprise visit to the opening of the recent Pororo feature film. The lecture meeting is to be held on Tuesday, April 23 at 7:30 pm at Somerset Palace, 2nd Floor Lounge. Fee for non-members and members is different. 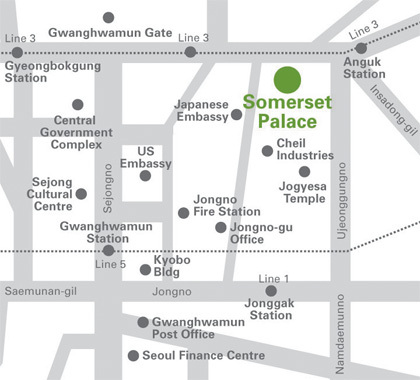 This talk presents some of the Asia Institute interviews with such scholars as Francis Fukuyama, Benjamin Barber and Noam Chomsky concerning contemporary Korean society. The topics covered include populism, social welfare, education, free trade and the outsider in politics. Congratulations on Your Monster-Hit Gangnam Style, Psy! We live in an age of surfaces; a tragic age of surfaces. What exactly does that mean? It means that computers have become so sophisticated that the videos, the photographic images and the logos for products they produce are perfect, as are the PC monitors, mobile phones, headsets and just about every other item in the house. In such a world as this, the world we live in, if you were to make something with your hands it would seem innately out of place when seen next to the perfectly shaped objects that you can obtain at a convenience store. That is to say you could labor for days and never draw as perfect a line as you see on the wrapper of a ramen package that you throw away. As a result, we have become accustomed to perfect surfaces, perfect designs, and flawless, if boring, layout in all the products that surround us. I would certainly not say that having products around one that are perfectly designed, from the bowl you use for your cereal to the gossip magazine you read in the evening, is bad in itself, but over time such a “perfect world” is a terrible burden, especially for young people. Young people are encouraged to be creative in school, to be innovative, but in fact nothing that you can make with your own hands measures up to the perfection found in the design of everyday things. As a result, our ability to be creative, to create new things, becomes extremely limited after the second grade of primary school. We cannot compete in our own actions with what we are exposed to, and even those who go on to be artists find themselves, knowingly or unknowingly, copying perfect examples of art that they see in photographs. But the tragedy is deeper than that. More often than not surface is mistaken for depth and young people become obsessed with looking good, with conforming to certain established appearances that they see around them. Of course the “creative bohemian” may be one of those looks, but ultimately the issue becomes one of how one appears, not what one actually does or thinks. You can dress up like an artist, but you cannot create anything. The pressure to look perfect has become enormous, to look like avatars in games or idols in posters. And as a result of such pressures, we see a tremendous increase in plastic surgery among young people. That practice takes its hidden and muffled toll on the soul. Young women and men feel compelled to spend money to force their bodies conform to the ideal human bodies that they see in movies and comic books. The fact that those human bodies they observe are not natural to start with is a secondary issue. That unnatural beauty has become the natural look in an age of hyper mechanical reproduction. The tragedy of embracing surfaces and leaving behind the depth of experience has a terrible price, no matter how great the initial thrill may be. A person caught up in the world of surfaces finds no way to express himself or herself directly, lest he or she create an rip, a tear, in the perfect surface of being. They are, after all, competing directly in the search for perfection with the perfectly rendered unreal world. Not much of a chance of finding happiness in that existence. Ultimately, one will feel ashamed of being oneself, of being human. All throughout Seoul we find young men and women laughing together in seemingly intimate groups, dressed up to be glamorous; striving to be perfect. They act as if all they care about is talking to their close friends, but all they actually think about it how they appear to the strangers they pass by. But when I look at their eyes, I can see that they are not laughing at all. That laughter they produce through years of practice is a ritual of surfaces; their eyes are mostly sad. Trapped inside the surface of things, such young people cannot even allow themselves to feel sad, to express their own inner worries. And so the tragedy of surfaces is complete. The oppressive world of trying to seem like someone else creating stresses that cannot be escaped. The first step towards a solution is recognizing the terrible tragedy of surfaces that haunts our youth and allowing them to look sad even when walking in a crowd. 중국 내몽골 다라터치의 산뜻하게 페인트칠한 농가 뒤편으로는 완만하게 이어진 낮은 구릉이 펼쳐지고, 들판에는소와 양들이 한가로이 풀을 뜯고 있다. 그러나 농가의 서쪽 방향으로 100미터 정도만 걸어가면 이런 전원적인 현실과는 동떨어진 풍경과 마주하게 된다. 바로 눈 닿는 곳까지 끝없이 펼쳐진 모래의 물결, 생명의 징후가 전무(全無)한 쿠부치 사막이다. 기후변화가 초래한 흉악한 산물인 쿠부치 사막은 지금도 800킬로미터 떨어진 베이징을 향해 가차 없이 동진(東進)하고 있다. 만약 사막의 동진을 이대로 둔다면 머지않은 장래에 중국의 수도인 베이징마저 점령당하게 될 것이다. 워싱턴에서는 아직 쿠부치 사막이 보이지 않지만, 사막의 모래는 강한 바람을 타고 베이징과 서울은 물론, 일부는 미국의 동부 해안까지 이동한다.